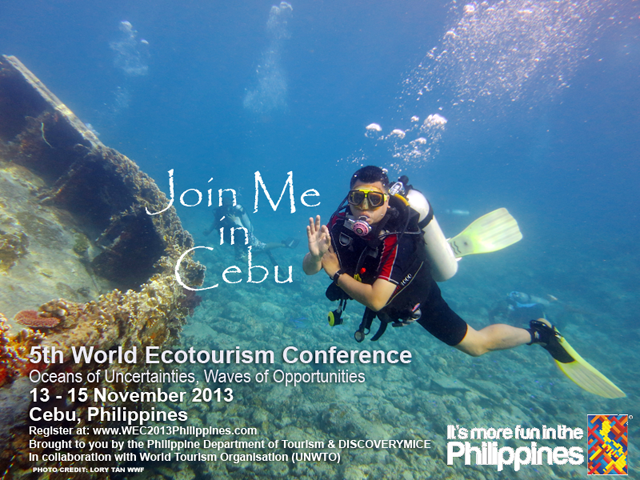 Under the auspices of the UN World Tourism Organization, PATA and DENR, the Department of Tourism in cooperation with the DISCOVERMICE will hold the 5th World Ecotourism Conference in Cebu on November 13 – 15, 2013. The event with the theme “Marine and Coastal Ecotourism: Oceans of Uncertainties. Waves of Opportunities” is expected to be participated in by about 200 foreign and 100 local participants. The World Ecotourism Conference is the world’s most important ecotourism conference for developing countries. It aims to pool political, financial and intellectual resources to empower both public and private sector practitioners, professionals & stakeholders in engaging and enforcing sustainable and practical tourism development policies and practices in every aspect of tourism development, management, financing and marketing. Relatedly, a soft launch of the updated Philippines National Ecotourism Strategy (NES) will be organized during the hosted lunch on 13 November 2013. Among the 55,000 islands in the oceans around the Asia and the Pacific region, there are many developing countries that are turning to promote their marine, coastal and riverine natural resources for ecotourism. Instead of ever-exploiting marine resources, marine and coastal ecotourism provide excellent export opportunities for many developing countries especially small island state countries. Local governments are increasingly aware of the need to provide the necessary capacity building for local communities in conservation work and the business of ecotourism in order to ensure that the long term ecological sustainability of the natural resources and financial sustainability of the business itself. Among the subjects to be discussed during the plenary by internationally renowned experts include: Management: Behind Marine Ecotourism Success Stories, Destination Development: Socio-Economic Value Beyond Beaches, Successful Ecotourism Marketing: Experience is The Real Thing, and Costal Communities: Eliminating Poverty through Sustainability. The World Ecotourism Conference is organized by DISCOVERYMICE, an affiliate member of the World Tourism Organisation (UNWTO). The Conference is an ambitious initiative to bring global ecotourism players together to network, collaborate and share their experiences, best practices and technologies for the advancement of nature conservation, environment protection, renewable energies, preservation of communities and their cultures and consequently the advancement of ecotourism around the world. A key objective of the World Ecotourism Conference is to help and support host countries that are in need of a global platform to champion, position or support ecotourism policies and initiatives that will bring transformational changes for the betterment of their economies, people or environment. In addition to Government facilitation, the private sector, academia and civil societies have an obligation to pool their resources and realize common aims and objectives; a concerted commitment to enshrine ecotourism principles, sustainable development and best practices in national tourism policies. The World Ecotourism Conference is the most prestigious ecotourism conference to be organized for both public and private sector tourism players in the ecotourism fraternity. With the support of the Cambodian Ministry of Tourism, United Nations World Tourism Organisation (UNWTO) and the Asia Pacific Ecotourism Society (APES) as well as encouragement of various ecotourism societies and associations worldwide, the World Ecotourism Conference usually invites over 30 renowned speakers and moderators and attracts between 250 to 600 key tourism players from over 30 countries. It attracts extensive media coverage in the region and around the world. The World Ecotourism Conference will enable top industry policy makers, stakeholders, sellers and buyers of eco-based tourism products to meet and share common ideas beneficial to all parties. It provides an excellent opportunity to network with eco-tour operators, eco-hotels/resorts, travel-trade partners, industry experts and gather the latest information, trends and updates, exchanging business and development ideas and exploring other untapped market segments and opportunities in the region. The event will feature some of world’s best authority in sustainable tourism and ecotourism as well as eco-sites and projects with best practices in local community welfare and wildlife conservation, and most importantly to market and manage the business of ecotourism. Ecotourism professionals / stakeholders, national and local policy makers, tour operators seeking new ideas for marketing and package development, LGUs with ecotourism sites or protected areas, professors / instructors, sellers and buyers of ecotourism products, eco-tour operators, owners / managers of hotels, resorts and conference centers, meeting planners, travel trade partners and industry experts, architects / engineers and consultants, academics and ecotourism researchers and indigenous peoples’ groups are invited to attend the annual conference. The Radisson Blu, Cebu is the official conference venue for the Conference. It provides deluxe accommodation with incredible city and Mactan Canal views. Enjoy plush, comfortable rooms with thoughtful amenities including Free Wireless High-speed Internet access. Dine at the hotel’s delicious Feria restaurant. For fun and relaxation, take a dip in the 800-square-metre, free-form pool. The conference is supported by the Cebu Association of Tour Operators, Provincial Government of Cebu, Provincial Government of Bohol, the City of Cebu, the City of Lapu-Lapu and the City of Mandaue.